1) Eradicate the Jante Law in Sweden and create an entrepreneurial retreat center at the farm house my father left behind in the middle of the forest in Småland, Sweden. 2) Realize the vision of the Herringbone platform, selecting a true Herringbone story from Africa and turn it into a musical on Broadway, NYC – with performing cast from Africa. 3) Enjoy life with family and kids. Someone said you should Dream Big… Michael E. Gerber always says: “Dream big, think small, and act even smaller”. If you don’t, it can be rather over whelming! What is your Dream? Start sharing it – otherwise it will never happen. And watch out – someone will ask you “by when” – and then you are hooked. Enjoy the ride, and Happy Martin Luther King, Jr. Day! 2) Boden Fortress Radio Bunker (Swedish: Radiobunkern i Boden) is a communications bunker, part of Boden Fortress, outside the city of Boden, Norrbotten, in northern Sweden. It was used for the first radio broadcast in Swedish history. […] At 15:00 local time on 12 July 1921, the first radio broadcast in Swedish history was sent from the bunker. Radio commissioner Axel Jenner conducted this historic broadcast, with the Swedish king Gustav V listening some 35 km away in Luleå. Due to a misunderstanding between Jenner and his radio telegrapher, the first words uttered in the broadcast were “jävlar anamma”, a Swedish profanity in the style of “damn” or “darn”, literally meaning “embrace the devils”. This week I also went through stuff from the office of my prior job of 8 years, and found the photo in this post that I used to have on my wall. 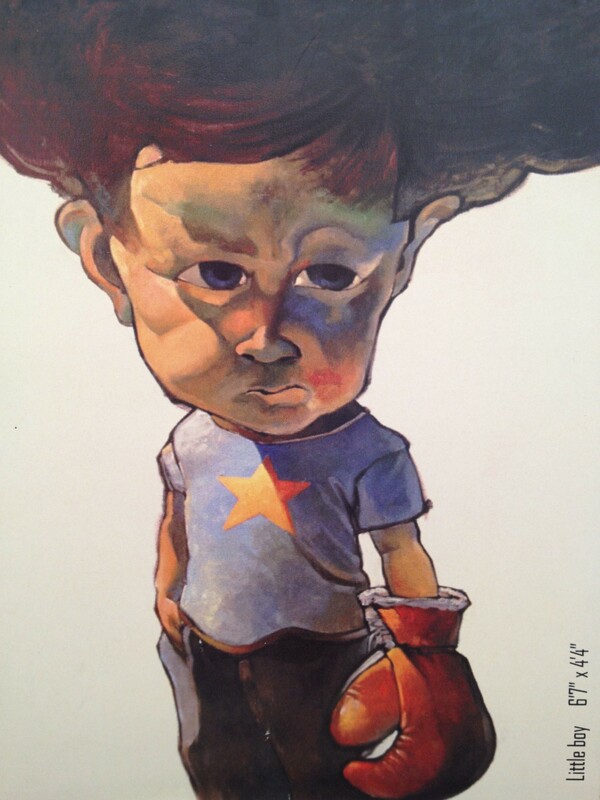 I guess it was the fighter in me that was inspired by this piece of art called “Little boy” by Swedish artist Martin Johansson. Here’s for some jävlar anamma – not to a fight, but to the fighter in you – for what you believe in. I am following up the next day with an email and she emails me back – and calls me back next day eager to work on her social media. We decide to meet for dinner. “Oh – I had already committed to this jazz event, but if you don’t mind I can give you a free ticket.” So we go. If you knew where I came from, you would appreciate the stretch and excitement this situation had. At Christmas we had a table card game going with various questions. One was “Which is the #one fear that you want to overcome?” My response: “Singing in public.” Solo that is. Hiding – and LOVING – singing in choirs is no problem. But I have had a desire and intent for a long time. Was I prepared now? Not really. But in some ways it felt like it. At one point my friend Valena and I was looking at each other smiling and saying in chorus: “This is not a coincidence”. Second last at 11pm: “-Which song? – Summer time. – Do you know which key? – No”. This is how it went. It wasn’t perfect – but it was fun, and I have come a long way. If I can, you can. What is your dream and intention? What ever that is – just come from your heart baby.